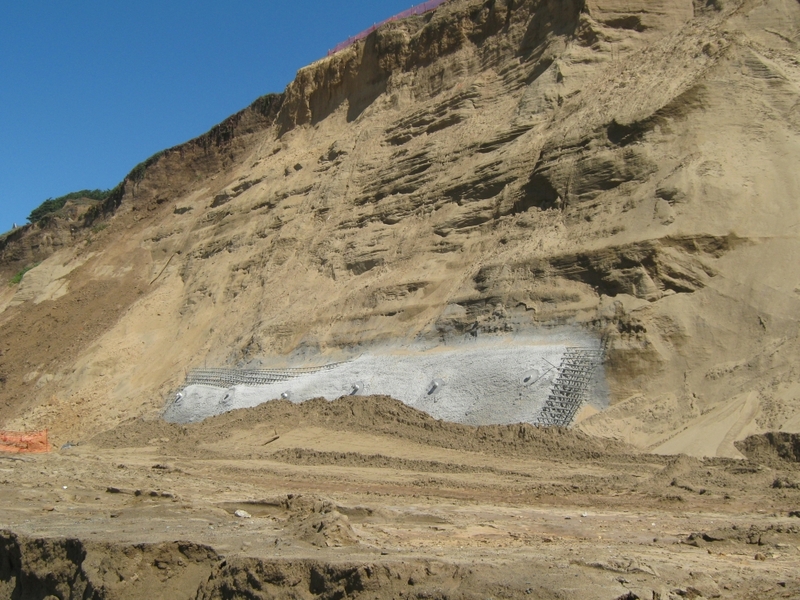 The Association of Bay Area Governments and the Coastal Sediment Management Workgroup invite the public to attend a meeting, on July 12th in San Francisco or on July 19th in Pacifica, to provide input on a Coastal Regional Sediment Management Plan, which is being developed for areas located between Fort Point in San Francisco and Point San Pedro in Pacifica. Please RSVP to Athena Honore: ahonore@waterboards.ca.gov or 510-622-2325. 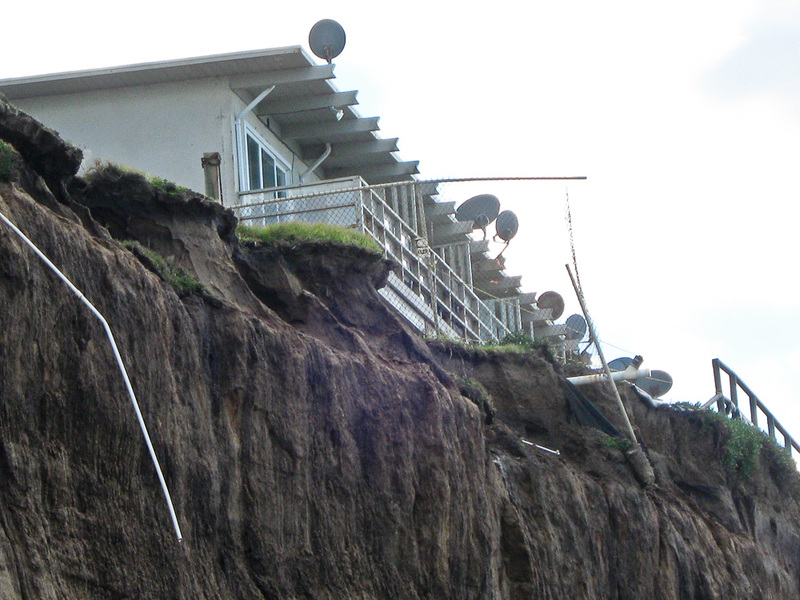 According to the building’s owner Dennis Thomas, the damage was caused by surface water drainage problems on neighboring 330 Esplanade. 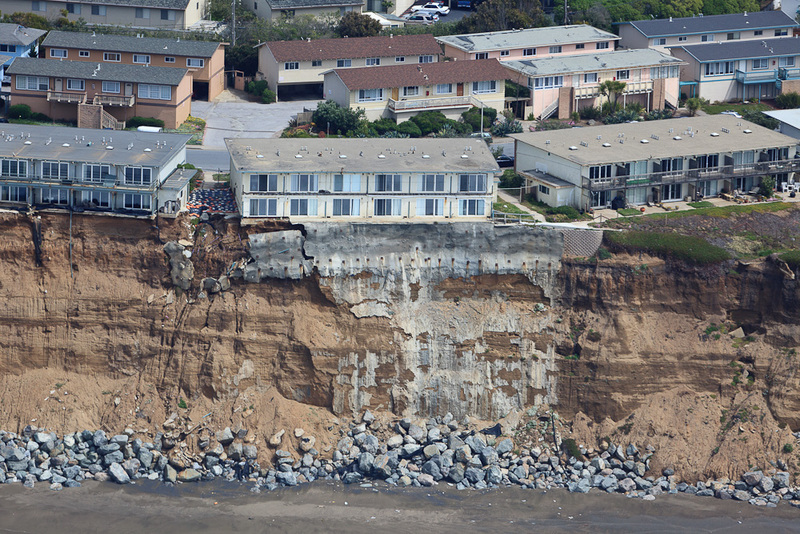 Things could be solved in advance with the cooperation of (FEMA and) the other agencies, but they say they won’t do it. 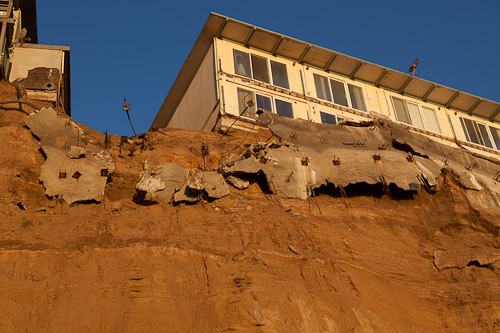 … We’re not asking for a handout or a whole repair, but at least help us. … It seems like their hands are tied as well. 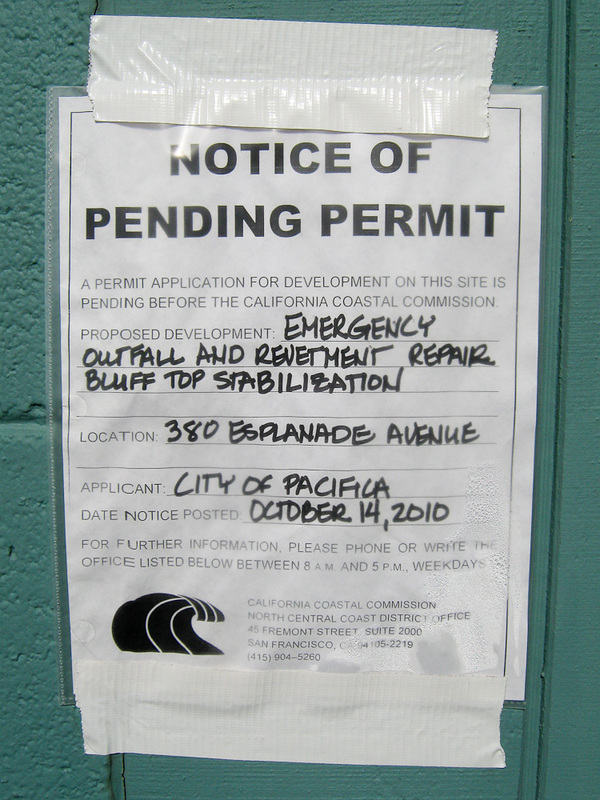 Once the property is abandoned it will probably become the responsibility of cash-strapped Pacifica. 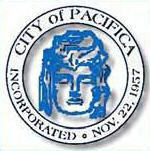 Pacifica building official Doug Rider said that the city might try to get FEMA funding to protect the property. 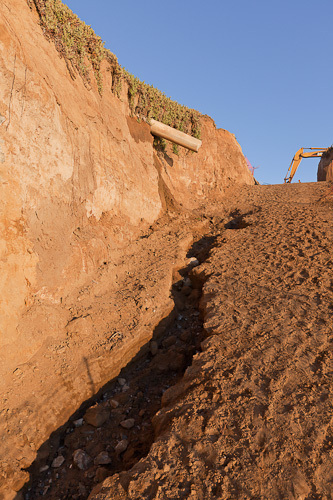 Meanwhile no work is taking place at Millard Tong’s 320 Esplanade building. 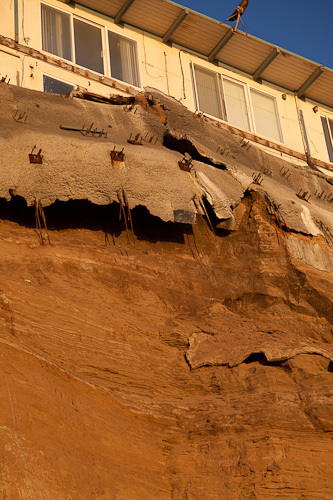 Both 320 and 330 Esplanade are enmeshed up in lawsuits with a former contractor over unpaid bills and accusations of negligence. 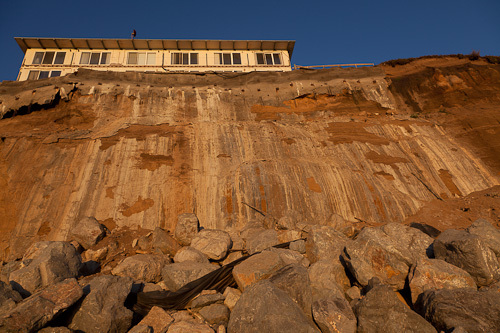 For more information including an update on the sea wall below Lands End, and additional current photos see the June 23 2011 San Mateo County Times article “Mother Nature threatens more Pacifica cliff apartment dwellers” by Julia Scott. 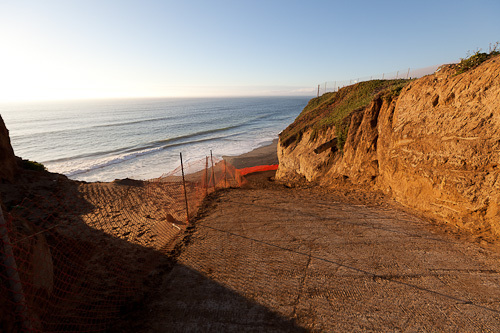 The graphic of the 340 property line was courtesy of Redfin.com: 340 Esplanade Ave.
Those squares of reinforced steel cement represent portions of a sprayed cement “shotcrete” wall with soil nails. I can see how they’ll eventually link up. 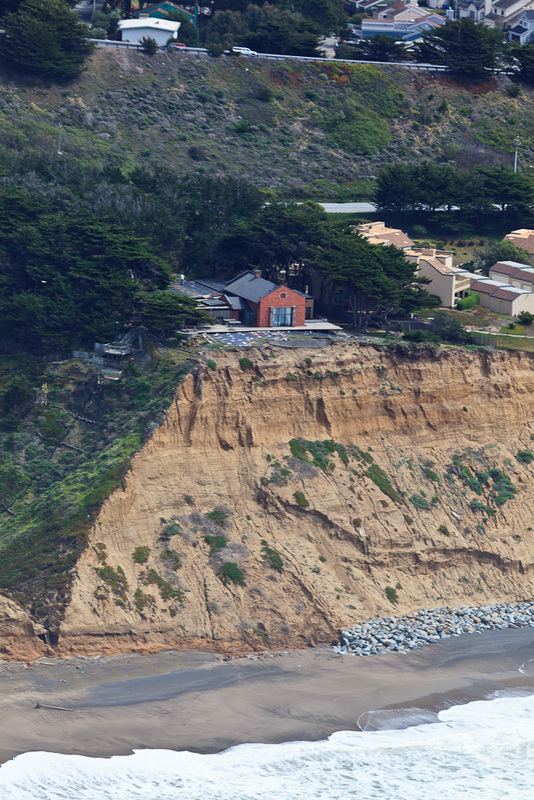 I guess they’ll have to go almost up to the 30′ surf line, but that’s a little harder to imagine. 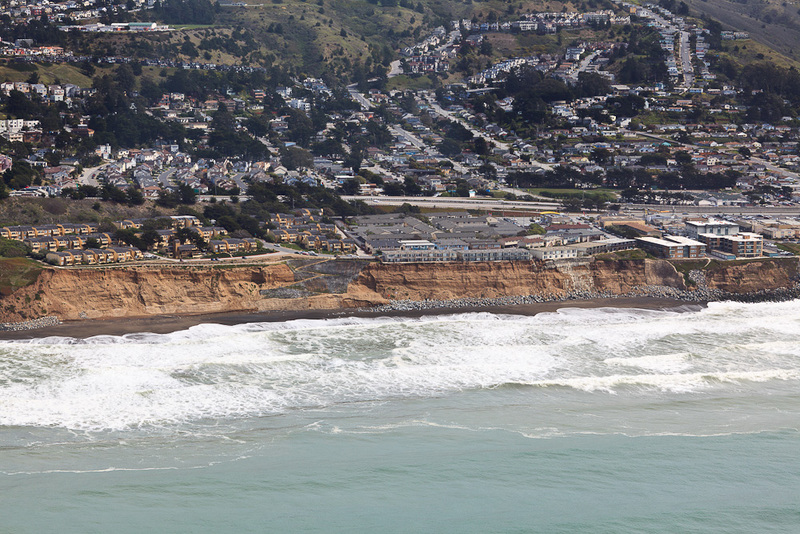 SFist: Those Buildings on the Cliff in Pacifica Are Slipping, Still. 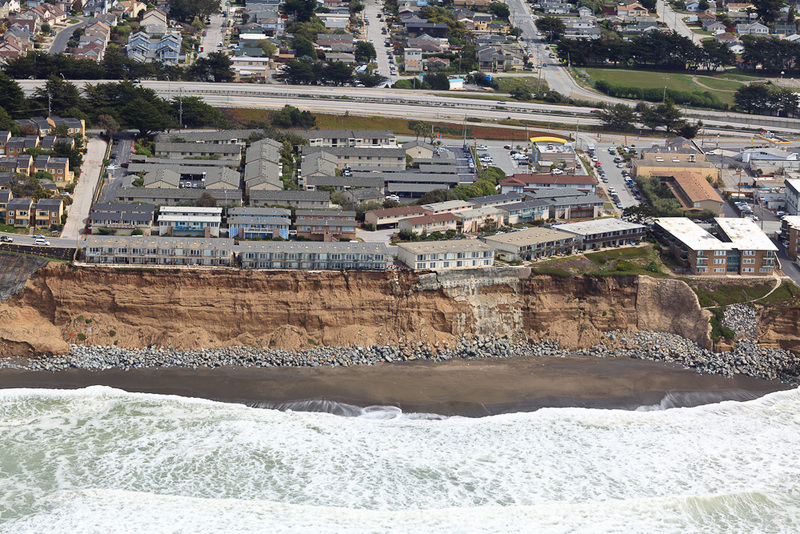 Those buildings cannot be allowed to topple into the ocean. 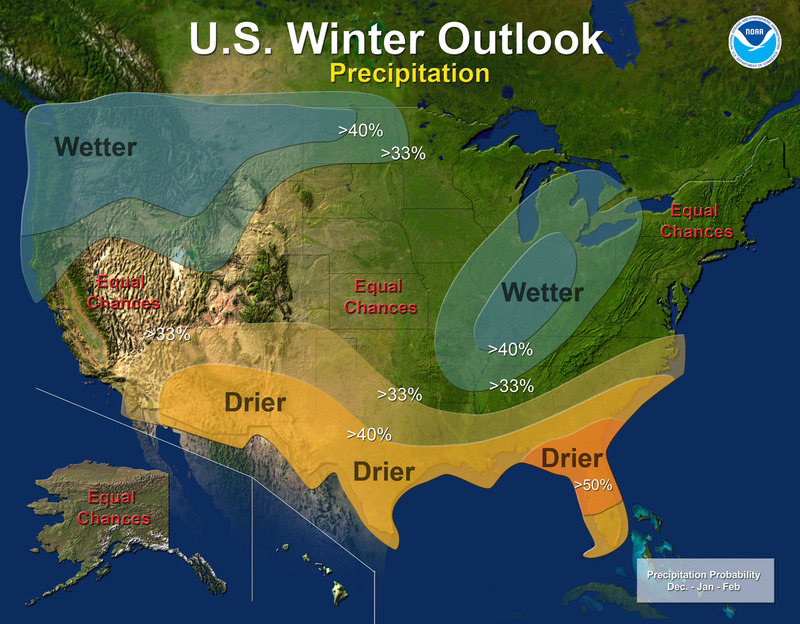 If we can make it through one more winter, it will give them [the owners] more time to raise that money. 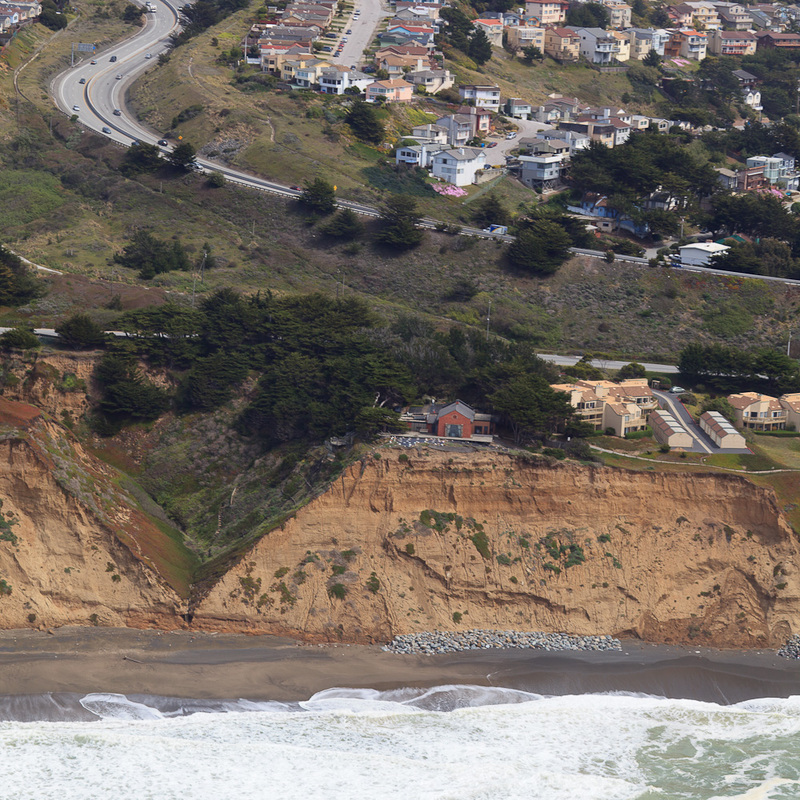 The news reports of the past hours share a common theme of unanswered requests for comment and reaction from missing property owners (see links here). 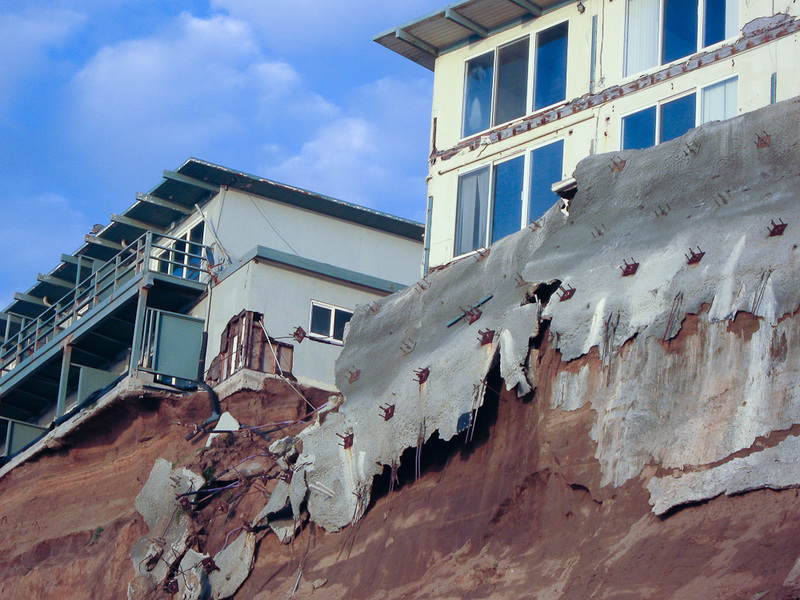 If experience is a guide, then we can expect the owners to respond slowly but adequately, and to request more time to look for the funds to rescue the buildings. 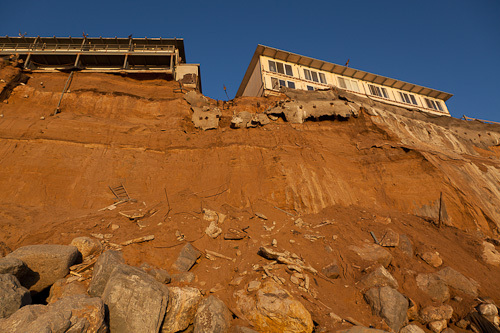 News of additional erosion under one or more buildings along Esplanade brought out both TV and print reporters and residents were treated to a hovering helicopter and a news van with bright lights on the dark street. 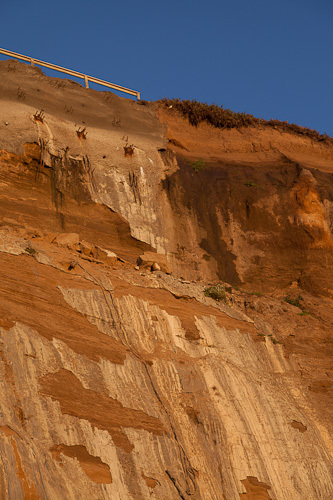 We’re waiting for up to pictures of our own, so for now we’re using a picture taken back on December 1, 2010. 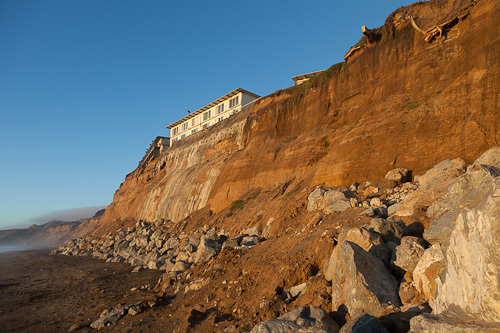 Julia Scott’s story, As Pacifica cliff crumbles, city scrambles for plan B, (San Mateo Times via MercuryNews.com) makes plain the dilemma facing Pacifica officials: how long to wait for the owners to take action before condemning the buildings. 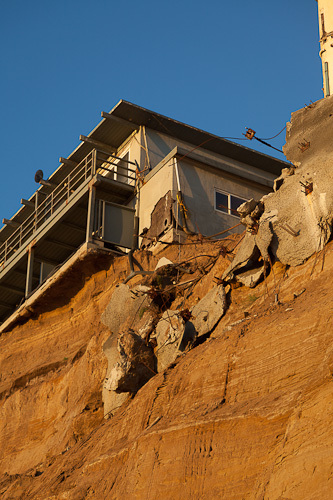 Scott learned that the vacant buildings are not in imminent danger of collapse. 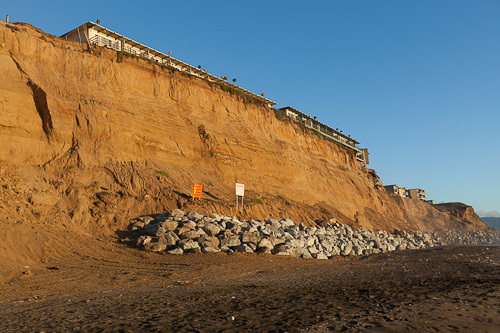 According to Pacifica Building official Doug Rider’s estimate another “30 or 40 feet” of bluff would need to disappear before they really start to “teeter and fall over.” Note that elsewhere in the story a much more dramatic, but WRONG, assessment of the damage was made by a building’s manger who indicated that one-third of a building is unsupported. 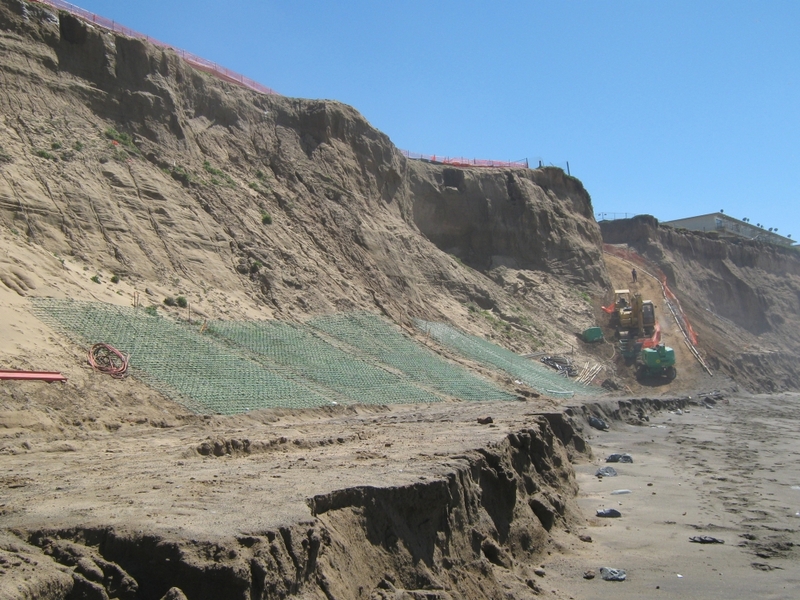 Both 320 Esplanade, seen on the left of this photo, and 330 Esplanade (right) have experienced loss of supporting soil. 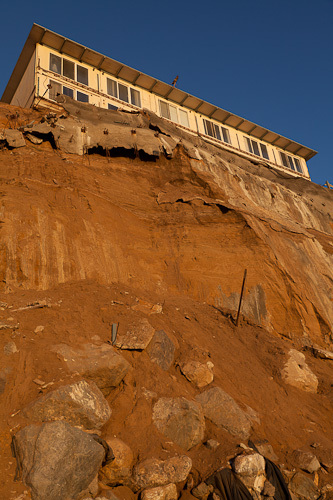 Amy Hollyfield’s video piece Rains cause more damage to Pacifica apartments (KGO-TV 7 ABC) reported that a building official with the city of Pacifica (possibly Doug Rider) said the piece that fell out was small, nothing too dramatic, but he said the building owner needs to do something to stop the erosion of the bluff. 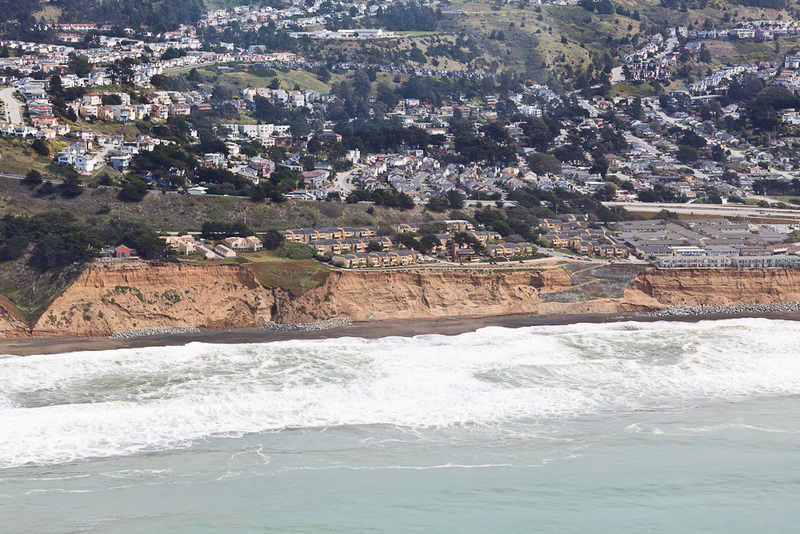 Meanwhile Pacifica is waiting for the owners to take action, an indication that owners intend to abandon the properties, or for the buildings to become a hazard. 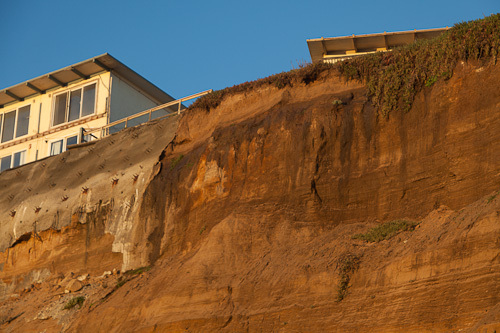 My prediction: the building owners will “walk away” (allow the building loans to foreclose, go bankrupt, etc.) 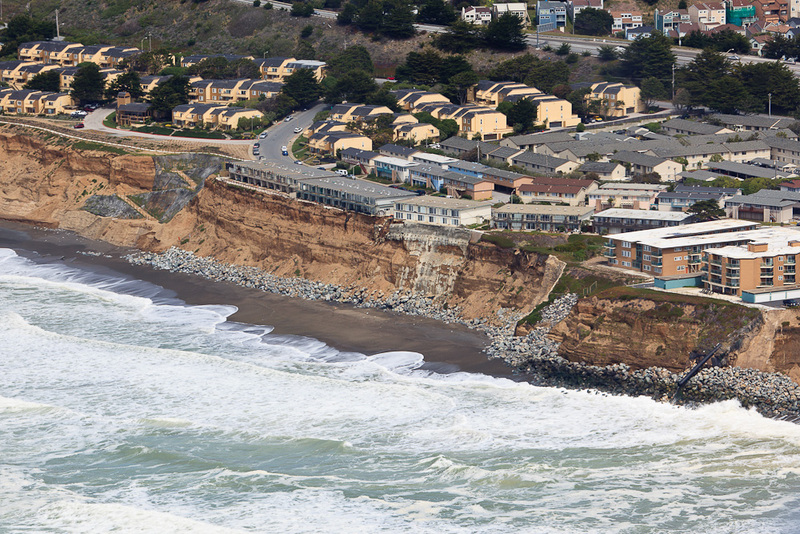 and Pacifica will have to pay for the demolition and removal of the buildings. 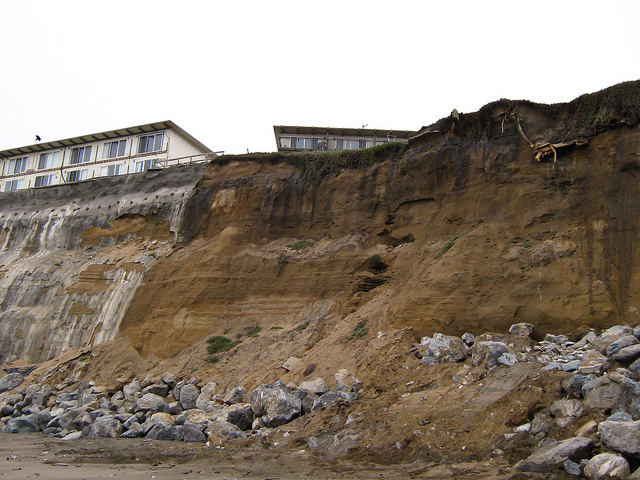 It is early in the winter 2010 season and already unmistakable signs of fresh groundwater erosion are visible beneath the buildings along Esplanade Avenue in Pacifica. 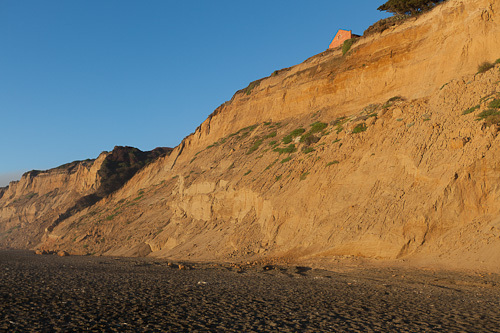 Groundwater, water flowing underground, weakens and separates the layers of soil, sand and clay beneath the buildings, and washes away the surface of bluff. 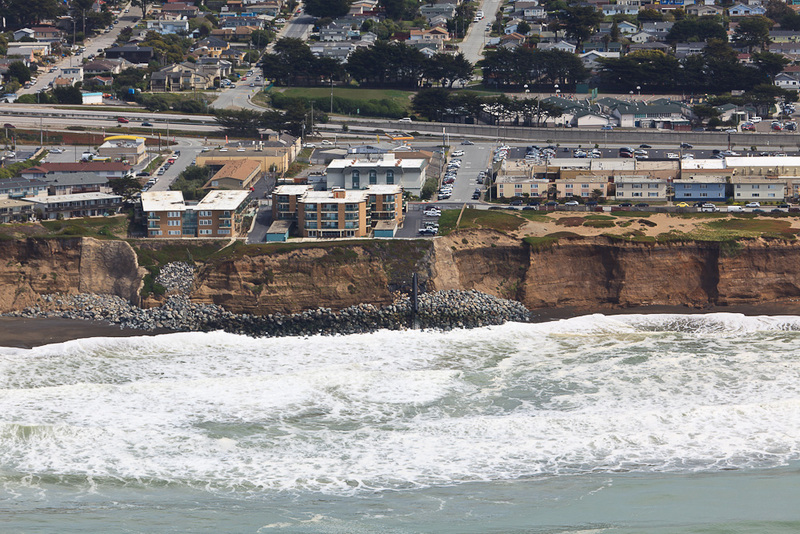 Given enough time groundwater will undermine and destroy the buildings just as surely as winter storms surf. 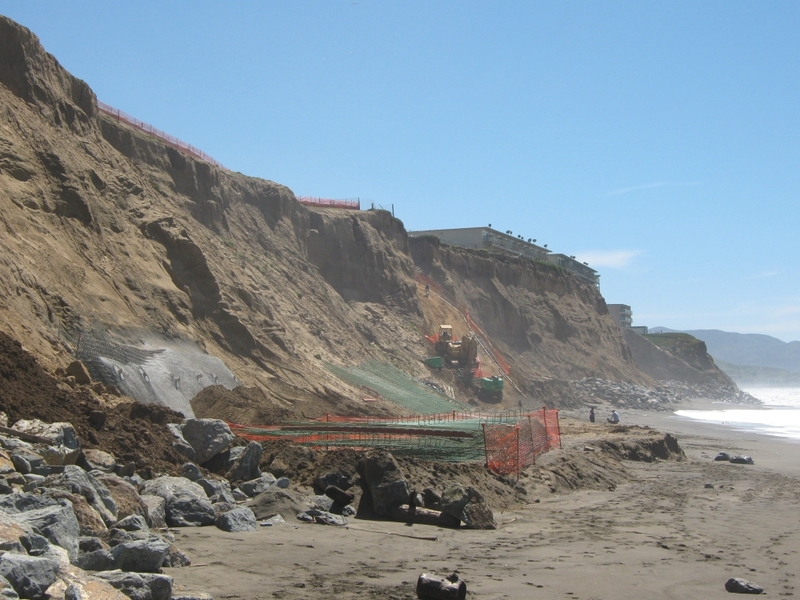 The owners, community, and city of Pacifica need to remain alert of the dangers posed to the unprotected buildings along Esplanade Ave. Those buildings, in turn, continue threaten the road, infrastructure and well being of the residents in the nearby neighborhood. 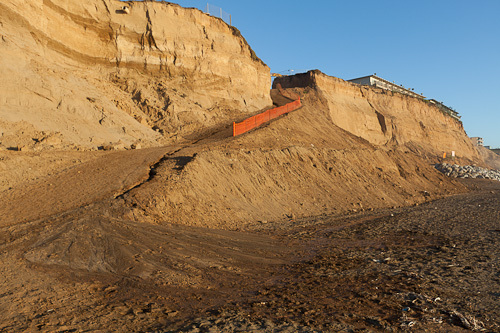 Darkened earth and soil, stained by fresh groundwater, is visible in the following photos of the bluff below the south end of 330 Esplanade Ave. To the left is the flaked and shredded unfinished concrete and soil nail project intended to protect that vacant apartment building. 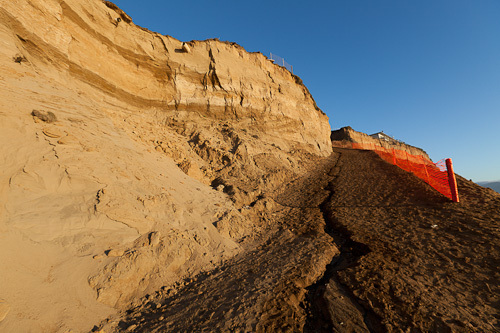 These were taken following a dry period, but the recent storms are starting to make a difference. 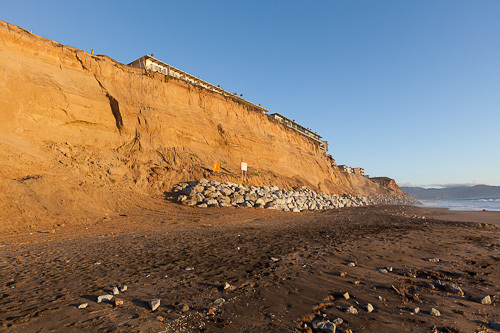 The still-occupied apartment building at 310 Esplanade Avenue in Pacifica stands atop a sand and soil bluff that shows significant fresh groundwater-related damage. 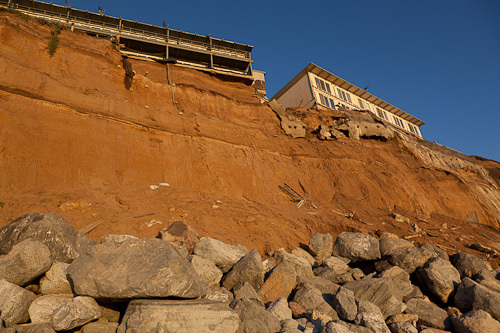 The vacant buildings just south, 320 and 330 Esplanade are also showing recent weather-related erosion. 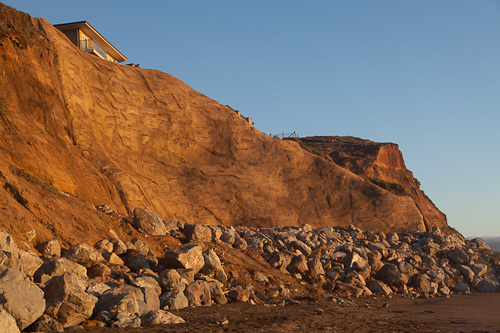 The base of the bluffs are armored with about 30 feet of massive boulders, and so far the winter storms have not produced surf approaching that height. 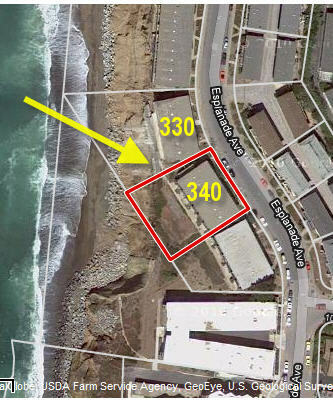 In this view we see the south end of 310 Esplanade and neighboring, vacant 320 Esplanade. 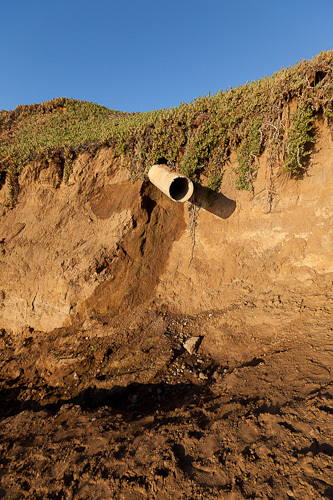 The earth – soil, sand and clay – beneath the protruding drainage pipe has receded since August. 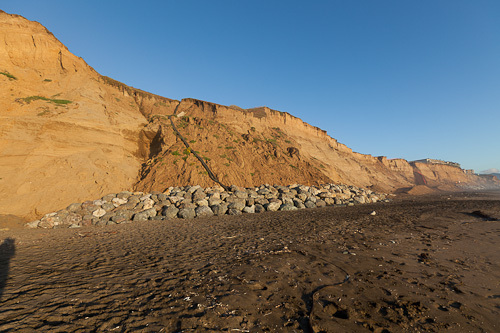 The north end of 310 Esplanade is next to the open “dog park”. 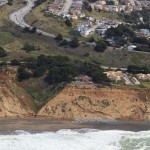 More threatening, fresh erosion is happening here, too. 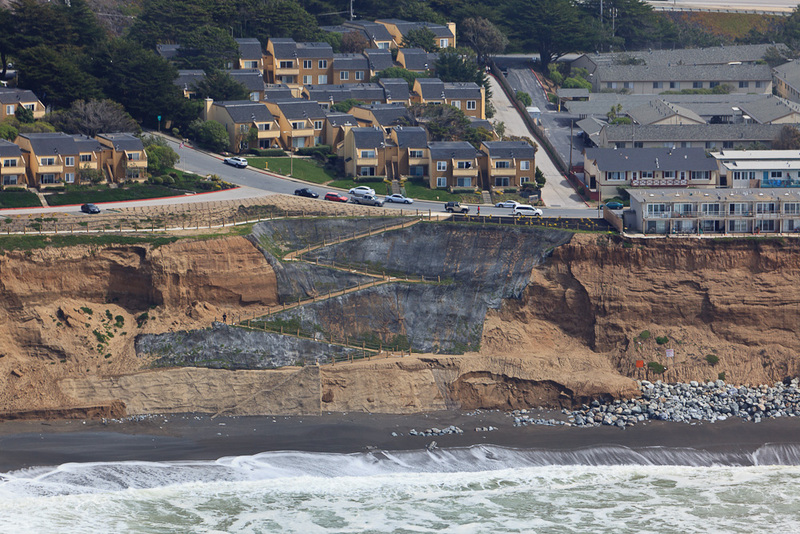 An area of more than 20 square feet has fallen away from the bluff, as shown in these photos. 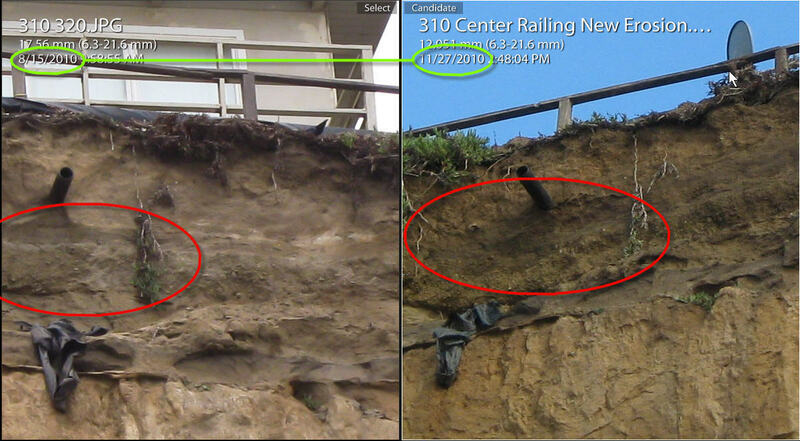 The amount of earth (sand / dirt / clay) that has fallen seems small so far. The 2010 CalEMA 400 Esplanade Storm Drain Outfall project will abandon the storm drain located on 380 Esplanade and will re-route all drainage that flows through the 380 Esplanade outfall to a new storm drain system running south within the Esplanade street right of way to 400 Esplanade. 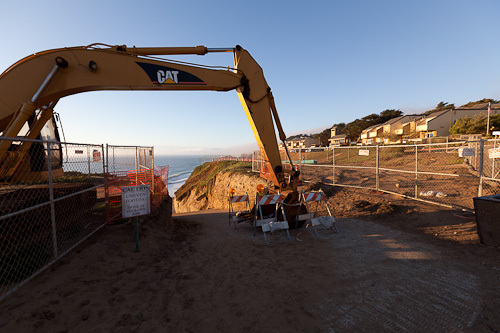 The proposed system will install approximate 900 linear feet of new pipe, 4 new manholes, 1 new drainage inlet and a new storm drain outfall on 400 of Esplanade just south of West Manor Drive. 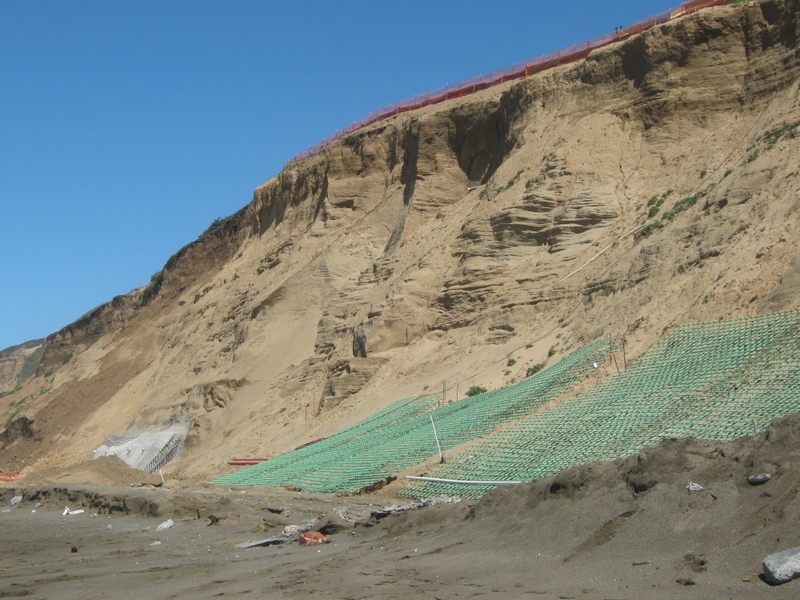 The original document can be found by search on the City of Pacifica website (www.cityofpacifica.org) or get it directly from a copy I’ve saved on this site: CalEMA 400 Esplanade Storm Drain Outfall (PDF, 1.1 MB). 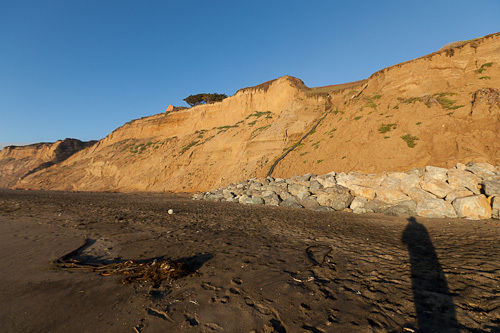 At low tide on a beautiful September evening (9/18/2010) I walked down the “dog park” access road and documented the current state of the bluffs and works below Esplanade Ave in Pacifica. 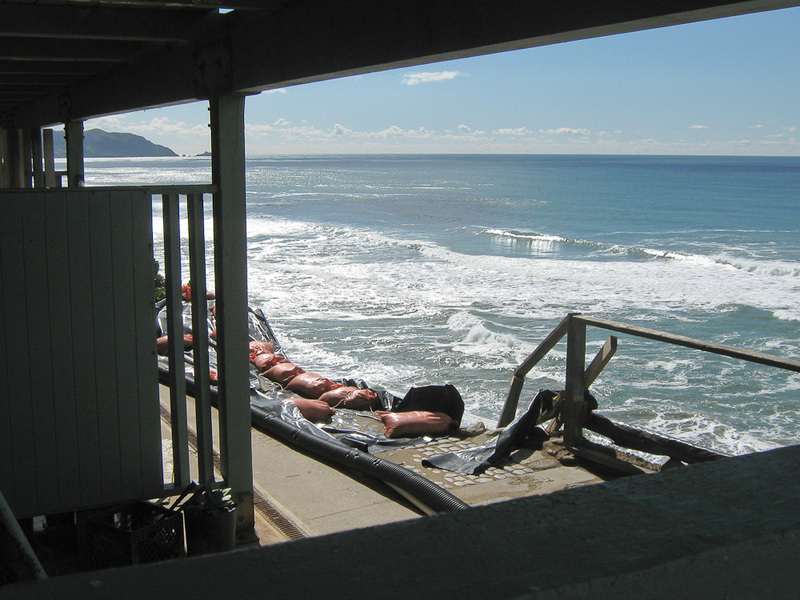 Other than 330 Esplanade, I found things in good state and about as ready for the winter storms as could be…. with several notable exceptions. 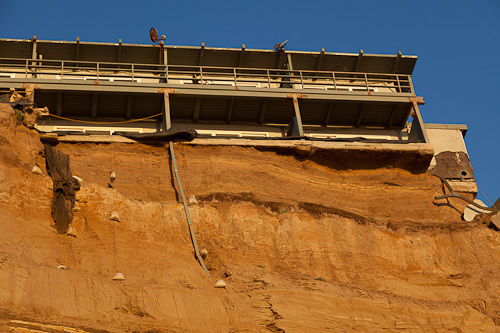 330 Esplanade – I didn’t see any signs of fresh dirt falls below 330 Esplanade, but I didn’t see any repairs or new work on the bluffs below it either. 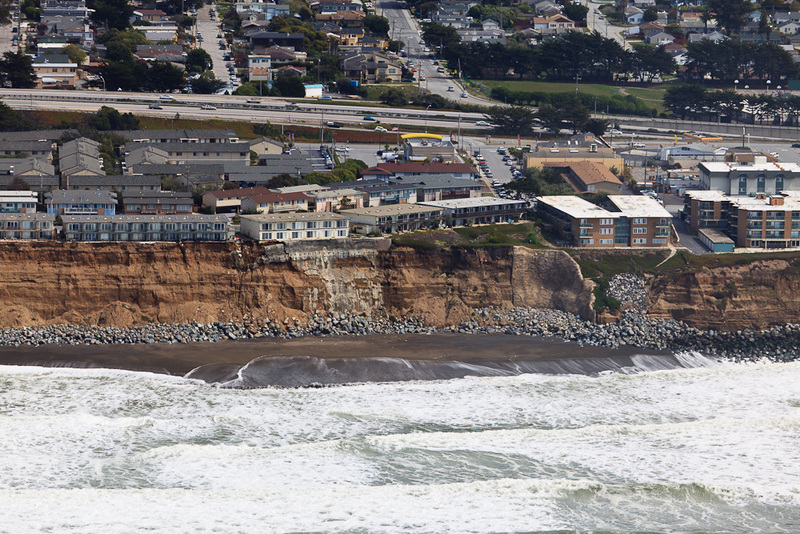 It was hard for me to avoid the conclusion that the rainwater and surf effects that closed the building last winter will continue to weaken and ultimately undermine the building. 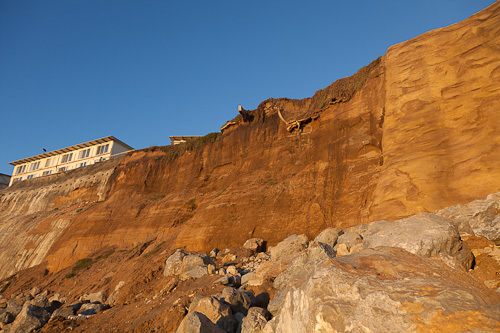 I guess I can’t know that the building will actually collapse down the bluff this winter, perhaps it will take more than one winter’s worth of storms to ruin the building and the gas, water and sewer lines that serve it. 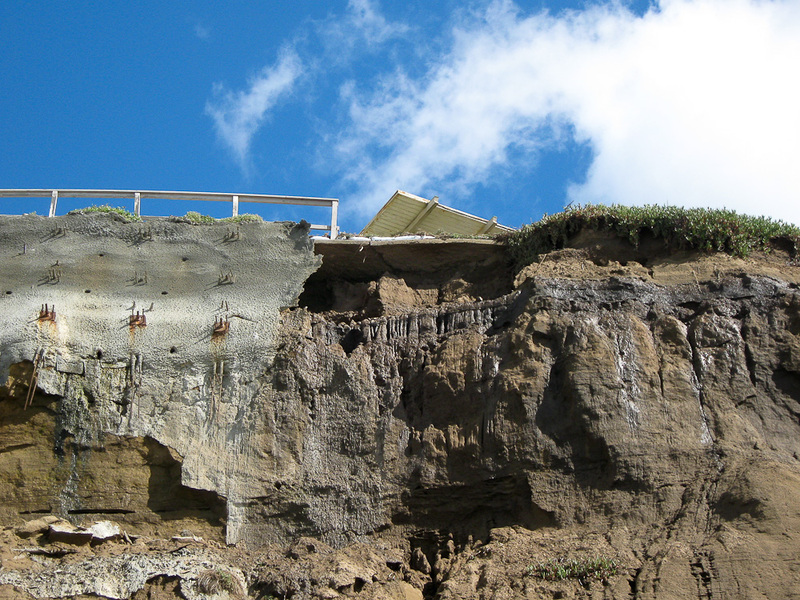 It doesn’t seem to be an exaggeration to expect the bluff to collapse though – after all, the buildings were evacuated as unsafe! 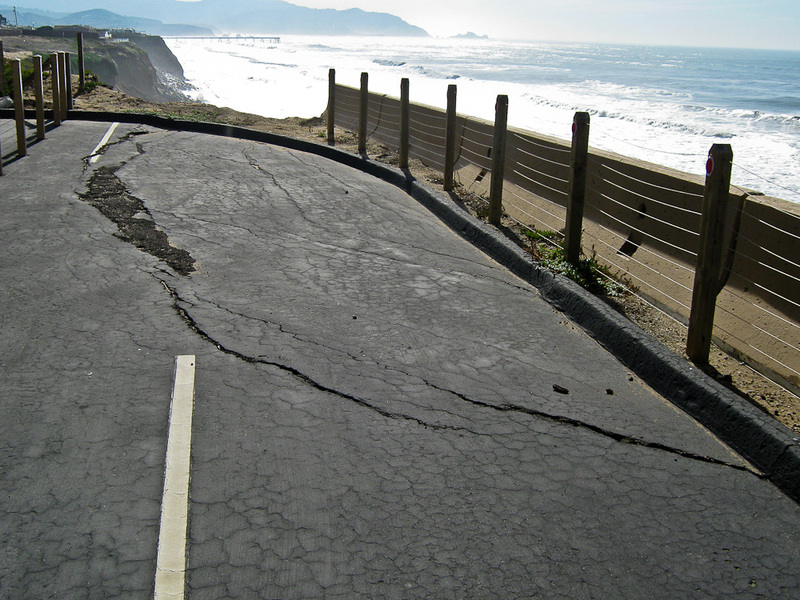 Access Road – the new beach access road is somewhat damaged by water runoff from a large white pipe. 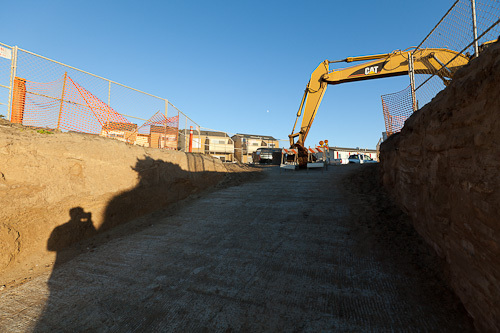 At this point the newly formed gully is on the inland side of the dirt road and out of pedestrians’ way. 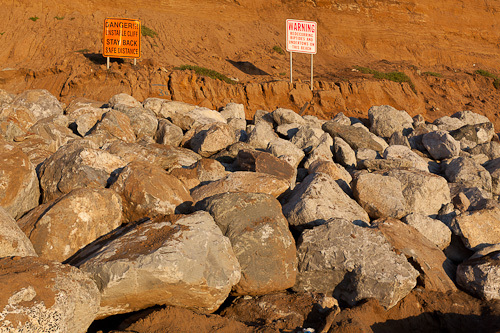 30′ Surf Mark – the rock rip rap below is not quite 30′ tall. 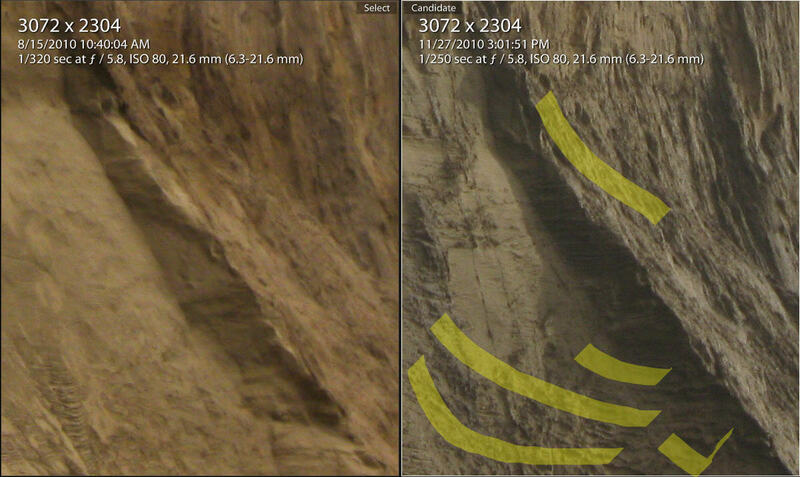 See the picture for the blue spray-painted marking.